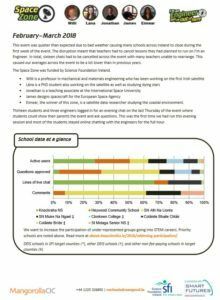 This event was quieter than expected due to bad weather causing many schools across Ireland to close during the first week of the event. The disruption meant that teachers had to cancel lessons they had planned to run on I’m an Engineer. In total, sixteen chats had to be cancelled across the event with many teachers unable to rearrange. This caused our averages across the event to be a lot lower than in previous years. The Health Zone was a themed zone supported by Wellcome. The Space Zone was funded by Science Foundation Ireland. Thirteen students and three engineers logged in for an evening chat on the last Thursday of the event where students could show their parents the event and ask questions. This was the first time we had run this evening session and most of the students stayed online chatting with the engineers for the full hour. The Robotics Zone was funded by Science Foundation Ireland, with five engineers working in different areas of robotics engineering. This was the quietest zone in this event with the lowest number of students logging in and questions in Ask. 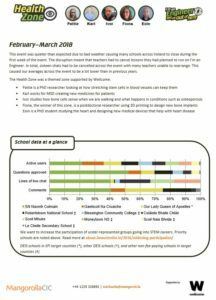 We assigned places to 14 schools, but only were six able to take part because of the weather disruption. Some teachers did hand out login cards so interested students could log in from home and use ASK section, and three students made use of the evening chat for families on the final Thursday.